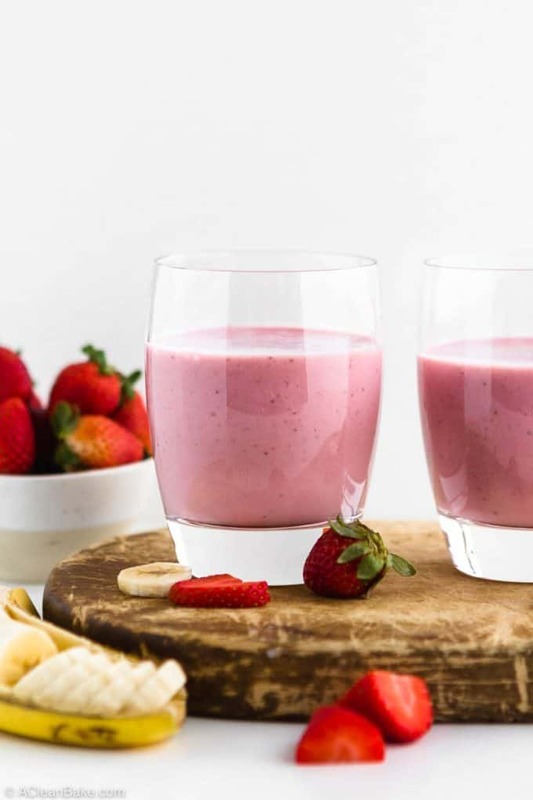 Delicious, healthy, and high protein strawberry banana smoothie that kids and adults love! Make it with dairy or alternative yogurt and milk (for dairy free), and use your protein powder of choice. This unbelievably adaptable and easy recipe makes a perfect go-to healthy breakfast or snack! There are some flavors you like from the start, others that you grow up liking, and the rest that you kinda force yourself to like or, in my case, learn to like out of solidarity. I, a card carrying strawberry-banana-flavor hater, gave birth to a strawberry banana lover. Seriously, the kid cannot get enough strawberry banana. Separately or together, he’s never met a strawberry or a banana that he wasn’t wild about. Coincidentally, I’ve never met a smoothie recipe that I wasn’t wild about (for him). So, we make his favorite smoothie several times a week. Sometimes twice a day if we’re having a particularly challenging eating day (if you follow me on Instagram, you know that my son is also a very picky eater!). This humble drink might not look like much, but you know what they say about judging books by their covers. So what’s so magical about a strawberry banana smoothie recipe? Like any good fruit smoothie, this delicious smoothie is sweet and fruity, but contains no added sugar. All of that sweetness and flavor makes it kid friendly. But the fact that it is naturally sweetened and flavored with fresh fruit and only fruit makes it adult-friendly as well. Because it is made with real fruit, this smoothie tastes like the real deal. Nothing artificial or syrup-y. And, most importantly for picky eaters, you can’t taste the nutrition-boosting add-ins either. Speaking of those add-ins. Smoothies can hide a lot of bad stuff, but this (genuinely) healthy smoothie is actually a vehicle for extra nutrition. Strawberries pack a vitamin C punch, while bananas are a good source of fiber, potassium, magnesium, vitamin C, and vitamin B6. So, not only is this a great immune booster and cold-fighter, it may also help regulate blood pressure (magnesium and potassium), aid digestion and maintain steady blood sugar (fiber), and support brain function (B6). And that’s just the fruit. 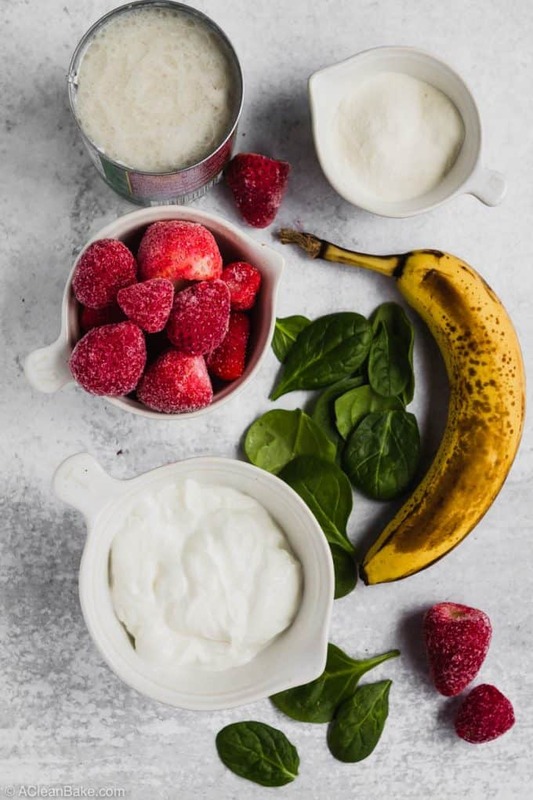 Protein in the yogurt and protein powder helps build and repair bones, muscle, and other tissue throughout the body – not to mention helping you feel full and sated after the meal. Fat from the yogurt and the coconut milk provide energy stores and slow digestion to help you stay feeling full, not to mention the important role that fat plays in brain development in kids. If you prefer, you can replace the coconut milk with plain kefir, which will add a gut-healthy probiotic boost to your smoothie. I make it both ways. Soft-steamed beets are relatively mild in flavor, but high in antioxidants, vitamin C, fiber, and folate (important for the health of cells in your body). They also bulk up the smoothie, making it feel more hearty, and if you use red beets, it will make the red color of the smoothie darker and richer. It’s always fun to eat pretty food! If you don’t care about the color, you can use golden beets instead. 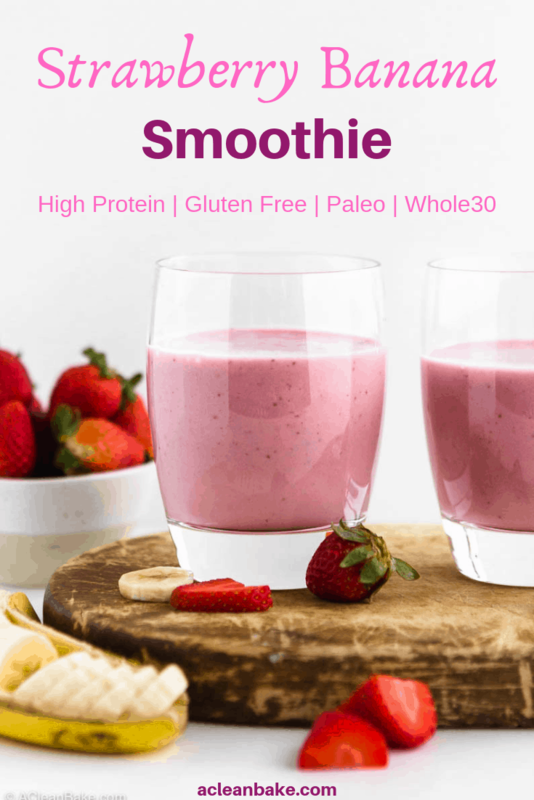 Gluten free rolled oats thicken the smoothie while providing fiber and antioxidants that may help control blood sugar, reduce your risk of heart disease and diabetes, and support healthy digestion. If you don’t eat grains, leaving these out won’t affect the smoothie at all. Leafy greens are an ingredient I try to sneak into as many foods as I possibly can. Just a small handful of baby spinach or kale provides an extra boost of vitamins and minerals, including iron, calcium, potassium, magnesium, and others. I use a small handful here so that it doesn’t impact the beautiful color of the smoothie. If you’re looking for a larger serving of greens, try a green smoothie instead! Like most smoothies, this one is highly customizable to your taste, your dietary preferences, and your ingredient availability. The fruit: You can use frozen or fresh strawberries. If using frozen strawberries, I suggest par-defrosting them so they are soft but not mushy or warm, before you put them into the smoothie. You can use frozen bananas too, if you’re desperate. But, I prefer to use fresh ones or leave them out and make this a plain strawberry smoothie. The yogurt: I use full fat plain Greek yogurt, which is the most filling. Since this is a high protein smoothie, pay attention to the protein content of your yogurt. For the most protein, make sure you are looking for strained Greek yogurt, not thickened. You can tell the difference by reading the ingredients and nutrition panel. If the ingredients are only milk and live active cultures (sometimes written as “yogurt cultures”), and the nutrition label shows double-digit protein per serving, you have the right stuff. If you see gums or thickeners in the nutrition label, and lower amounts of protein per serving, that’s just regular yogurt with gunk in it to make it feel thicker. You’re not getting much, or any, more protein than you would from regular yogurt. For the greatest protein impact, make sure you’re using strained Greek yogurt, not thickened. But using thickened, or even regular (non-Greek) yogurt will be fine in this smoothie too. I mentioned above that I use full fat yogurt, but if you prefer nonfat or low-fat (or if that’s all you have in your fridge), that is totally fine too. You can also use non-dairy yogurt to make this dairy free, vegan, or Whole30 compliant. The protein powder: Use whatever protein powder you prefer. 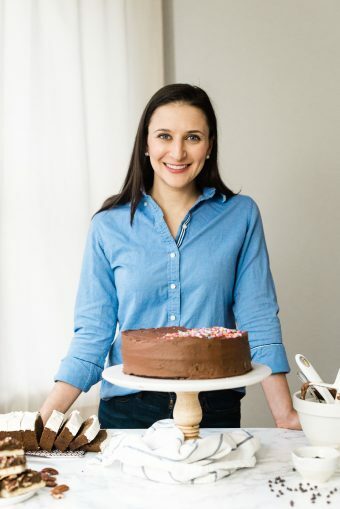 I’m struggling to incorporate more collagen into my diet, so that’s what I use, but you can use whey, egg-based, or plant based, particularly if you’d like to make this vegan. The blending liquid: The recipe calls for 1/4 cup coconut milk or plain kefir. You can also use water, almond milk, or dairy milk, but coconut milk and kefir produce a thicker, richer smoothie. The Meal: Enjoy this smoothie any time of day. My son likes it as a breakfast while I sometimes eat it for lunch or an afternoon pick me up. Minimal ingredients, minimal prep, quick blend – and you’re done! 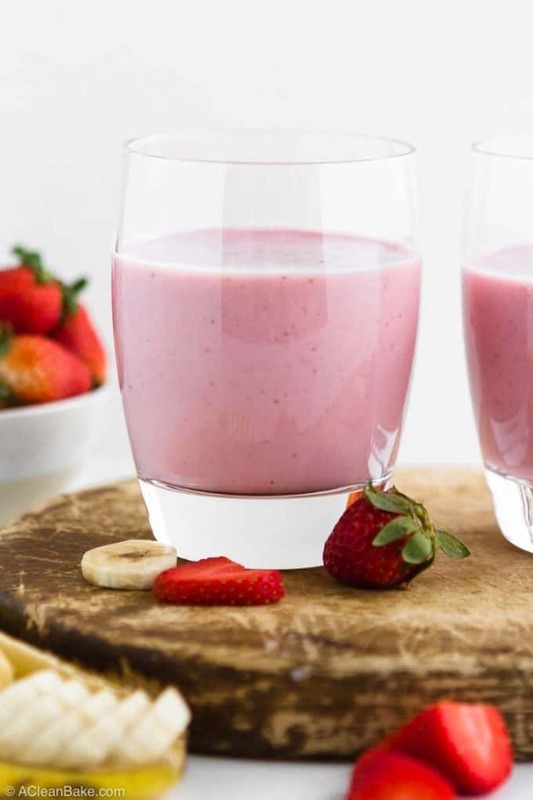 What will you need to make this strawberry banana smoothie recipe? Fruit: Real strawberries and ripe bananas are all you need. Yogurt: Plain yogurt thickens the smoothie and provides a hefty dose of protein. Coconut milk: For richness, and to blend. Protein powder: For that extra boost of protein. In additional to the “nutrition-boosting” optional ingredients listed in the recipe – oats, beets, and leafy greens – you can also add a scoop of almond butter or peanut butter, or a couple spoonfuls of chia seeds or hemp hearts for a little bit of extra nutrition and staying power. You’ll also need a blender! Any kind works; you don’t need an expensive high powered blender. In fact, I typically make this in a Magic Bullet. However, if you’re not using one of the more powerful blenders, be careful about using whole, fully frozen fruit. I like to par-thaw my strawberries for the Magic Bullet, so that I know they will get full blended. If you’re using a high speed blender (like a Vitamix), it’s not a necessary step. How do I make this smoothie a little sweeter? Either use the full banana, or add one tablespoon of honey (or more, to taste). 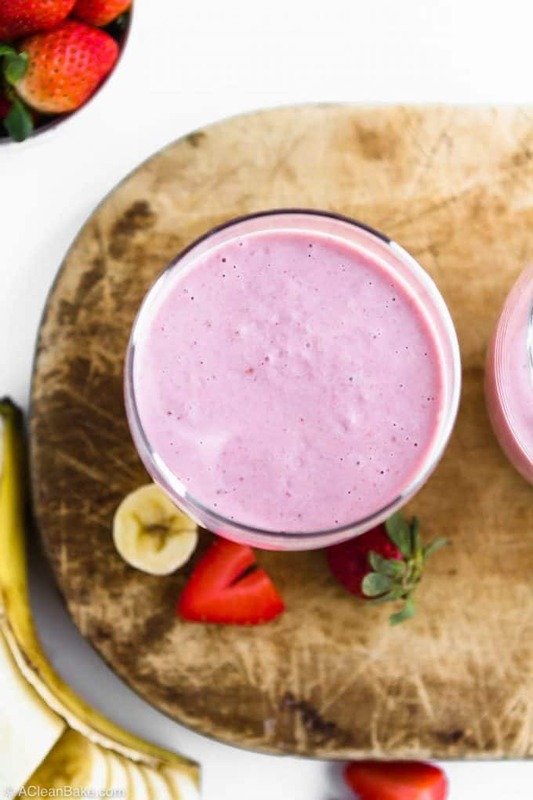 How do I make this strawberry banana smoothie with milk? Replace the coconut milk with dairy or non-dairy milk. 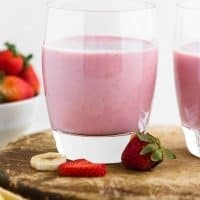 How do I make this strawberry banana smoothie without milk? You can replace the coconut milk with water. The smoothie won’t be quite as thick, but you won’t notice. How do I make this smoothie with ice? If you want a thicker, frostier smoothie, use frozen fruit (strawberries AND bananas) and/or add ice before blending. You’ll need about 1/4 cup ice. Make sure you’re using a high powered blender to ensure the ice gets fully incorporated. If you don’t want an icy smoothie, just follow the recipe as written. This is not just for little ones! Big or small, this fruit smoothie will become one of your favorite breakfasts in no time. 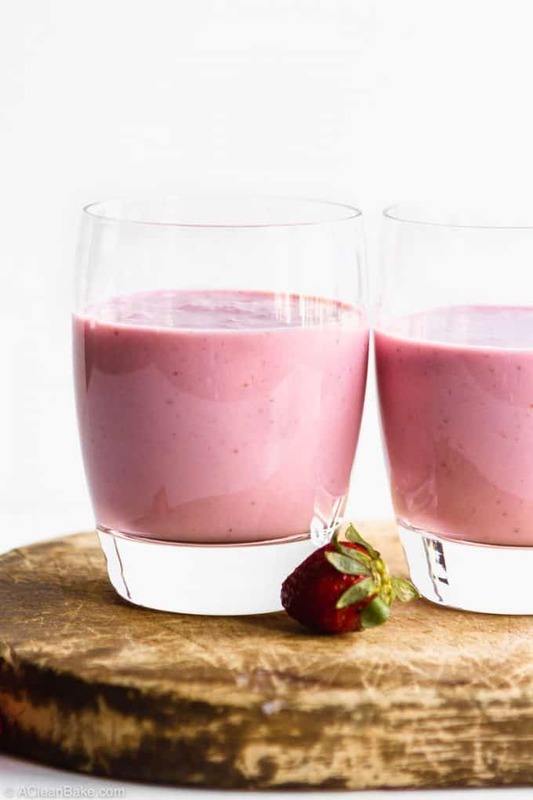 Break free of your green smoothie rut and try this classic strawberry banana smoothie instead! Combine all of the ingredients in the canister of a blender. Note: nutrition information includes all optional ingredients. Hi, Before I make strawberry and banana smoothie individually. But this is the first time I have ever seen to make strawberry and banana smoothie combindly. But seriously, this look amazing also delicious. I will try it for sure.